"You're on island time now!" - That's quite the tagline for a beer. Manitoulin Brewing has never been available until now as part of MLCC's Coast to Coaster event. For the event, Manitoulin Brewing's Swing Bridge Blonde Ale is making its debut here in Manitoba. 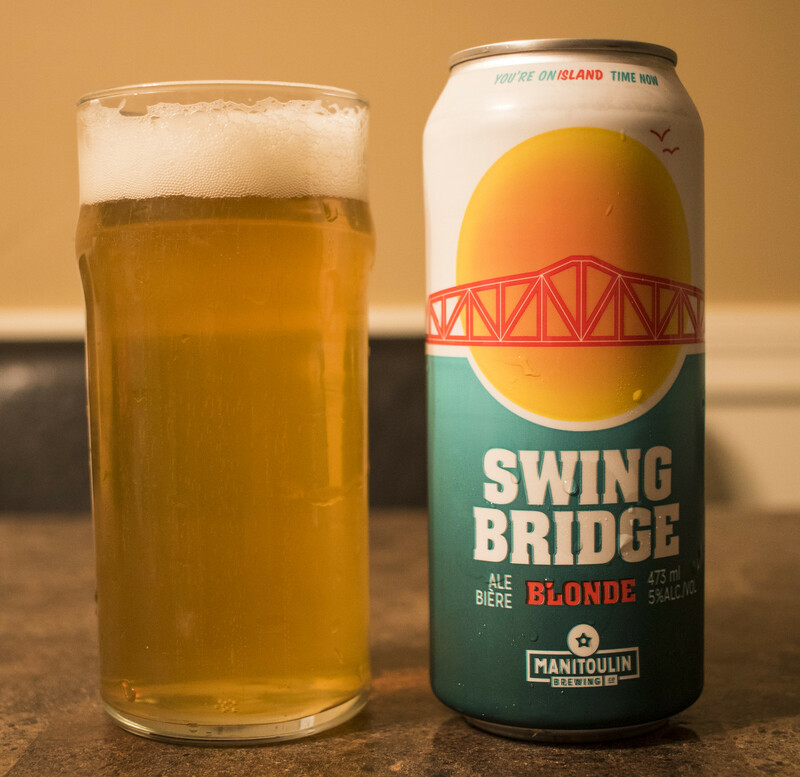 Swing Bridge Blonde Ale is apparently currently the brewery's only canned product. The Swing Bridge is described as distinctively smooth, flavourful and fresh. Tops out at 5.0% ABV and 22 IBU. It's brewed with Brewer's Gold and Hallertauer hops. The Manitoba connection in this beer is that Brewer's Gold hop originated in the wild in Manitoba as BB1, pretty cool.. huh? Appearance: I was expecting a Labatt 50 sort of consistency in this beer.. so a clear, pale straw body with lots of carbonation and a moderate amount of head that diminishes almost immediately. This isn't the case - It's a cloudy, unfiltered lemon yellow body with a moderate amount of carbonation and a good amount of white head on top, foam that's barely diminishing. Aroma: Fairly malt-forward but it also has a nice hop presence in this blonde. It has a sweet yet grainy grainery aroma to it, a hint of lemon, grassy and slightly bitter leafy hops, and for the most part.. it's kind of reminiscent of many craft blonde ales I've had, such as Picaroons' Blonde Ale. Taste: A cereal/grainy flavour up front that's pretty sweet. There's notes of lemon, grassy and slightly bitter hops to it. It's easy on the palate - fairly clean and crisp. Nothing overpowering in any sense in this beer. Overall Thoughts: The beer is your standard craft blonde ale, and in a time like right now where craft breweries are trying to woo customers away from Labatt, this is definitely something I could see being raved about by someone who typically drinks Labatt products but is willing to try something new. The beer is fairly sweet, lightly hopped and bitter. It's easy to drink and would pair well with bonfires, but you know that this isn't something I'd generally ever crave. I'm glad to see a brewery on Manitoulin Island in Ontario, every community in Canada deserves their own community/local brewery. In fact, Manitoulin Brewing officially opened back in May and they already have a presence in Manitoba, that's pretty cool!